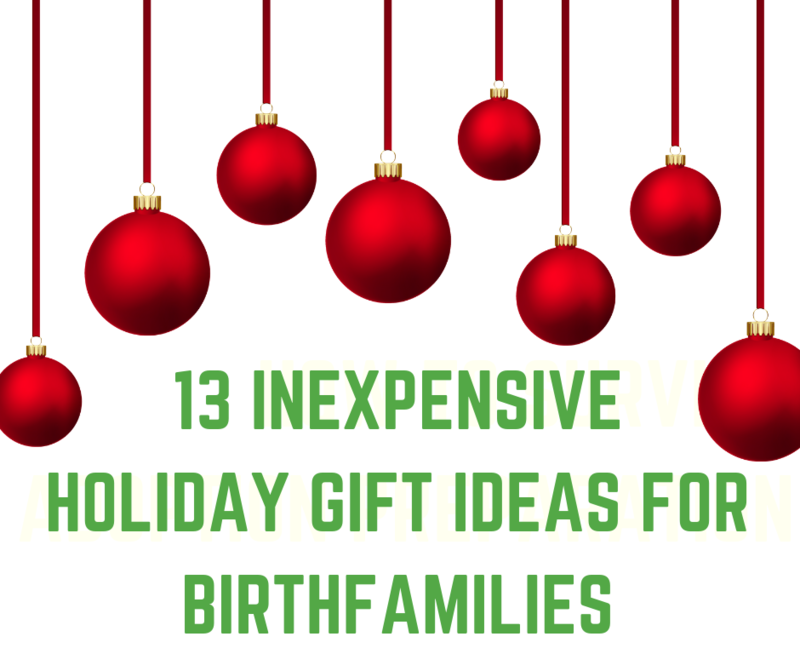 The holidays are coming quickly and you’re likely thinking about your child’s birthfamily. Whether you have an open adoption, closed adoption, or something in between, sending an inexpensive but personal holiday gift could mean the world to any member of your child’s birthfamily. 1. Handprint ornament. Yep, it’s cliché. You know, the little round clay-like ornaments that your child’s handprint or footprint goes on. You can buy these for under $10 and having that sweet little shape stamped on an ornament forever can be a very meaningful gift for any member of your child’s birthfamily. Write a little message on the back and include the date. 2. Globe ornament. These are a bit more delicate and may need a little more care if you have young children. But I love the glass globe ornaments where you can put small items inside. Maybe you load it with some leftover craft supplies (glitter, sand, beads, paper mache, etc.) from the last art activity you did with your child. If your child is a little older, you could make a beaded necklace together and put one inside. Add a personal touch by writing a note attached telling them why you choose the items inside. 3. A favorite blanket or stuffed animal. If your child had a favorite lovie, stuffed animal, or blanket (that they no longer use) send it to your child’s birthparents. Include a note with the significance of the item and the timeframe in which your child used it. 4. Personalized teddy bear. There are wonderful sellers on Etsy, such as this one, that take a blanket or outfit and sew it in to a stuffed animal. They’re cute, snuggly, and fairly priced. 5. Personalized jewelry. This can be a bit more expensive but there are hundreds of options on Etsy that are still under $25. Customize a bracelet or necklace including your child’s name or just simply the date of birth. This is something your child’s birthmother could wear every day. 6. Ornament from a trip. If you’ve recently taken a vacation or special trip with your child, purchase an ornament from your destination and gift it as a holiday gift. Write on the back with the dates and let your child’s birthmother or birthfather know that you think about them wherever you go. 7. Tickets to play or activity. If you have an open adoption, purchase tickets to a show or activity that you can all go to together! Maybe it’s the zoo, or discovery center, play center, art class, or music class. Include your child’s birthfamily and I’d bet they’d be thrilled! 8. Paper card. Most kids love to paint, draw or color! Maybe they’ve brought home hundreds of art projects from school and you have no room left on your refrigerator! Send such works of art to your child’s birthfamily! Gifts do not need to cost any money to be meaningful. These personal touches are things that the birthfamily misses out on so spread the love and artwork! 9. A plant. Plant a small indoor plant with your child. Let them dig in the dirt and choose the plant from the garden store. Write on the bottom of the pot the date it was planted. Then your child’s birthfamily can watch the plant grow right along with your special kiddo. 10. Paint a pot. If your child’s birthmother or birthfather likes plants, make them a special painted pot to plant in! Let your child go crazy with paints on a ceramic or clay pot. If you have access to glaze and an oven, you could take it a step further to ensure the paint lasts for a long time! 11. Favorite book. If your children are like mine, they read constantly. We have so many favorite books that we’ve read 100 or more times. A much-loved book is a wonderful gift to send to a birthfamily! Yep, there are probably ripped pages, taped corners, and maybe even some drawings inside but this makes the book even more sentimental! Write a note on the inside cover and include the date and they’ll cherish it forever. If the book is something you still want to have for your child, buy yourself a new copy! 12. A framed puzzle. This year we’re working on puzzles! They’re fairly small (about 8.5 x 11) puzzles and I’m planning to place them in a frame when we’re done! We’ll write a note on the back saying how hard we worked on it and the date. Having something that your child put together with his/her own little hands can be very sentimental for a birthparent. 13. A canvas print. Get some high-quality photos taken of your child and your family. 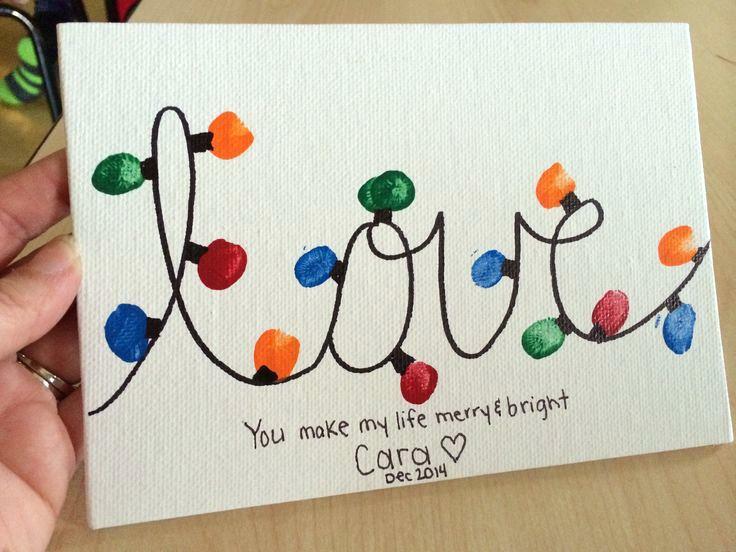 Print a couple of your favorite images on canvas and give as a holiday gift! As parents, we love photographing and having precious memories of our children. I’d imagine any birthfamily would love having canvas prints of your little one. Options for inexpensive, creative gifts from your child are endless! Don’t worry about having to spend money to show your birthfamily how grateful you are for them. These personal touches are much more sentimental and made with love. Happy holidays!